Senegal have been disqualified from the 2013 Africa Cup of Nations after a riot forced the abandonment of Saturday’s home tie with Ivory Coast. It is not yet clear whether the Confederation of African Football will take further action against Senegal. The match in Dakar was called off after 74 minutes, with Ivory Coast 2-0 up on the night and 6-2 ahead on aggregate. Caf has officially confirmed the result as a 2-0 win for Ivory Coast, sending them through to next year’s tournament. Senegal manager Ferdinand Coly said on Sunday that “Senegal will accept the sanctions”. He also apologised to Ivory Coast. Trouble flared after striker Didier Drogba scored his side’s second goal from the penalty spot. Visiting supporters were forced to leap down on to the pitch to escape as violence erupted, with home fans throwing missiles, stones, bottles and firecrackers. 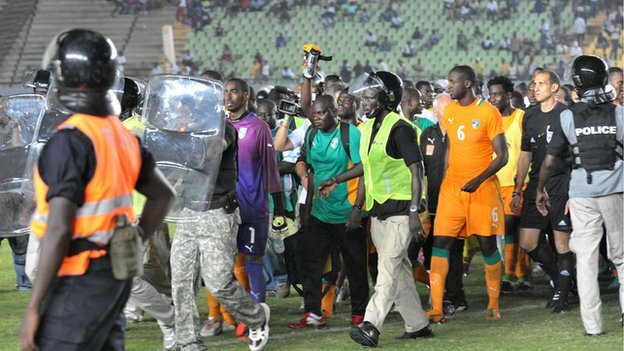 Ivorian players took refuge in the centre circle while the security forces used tear gas to disperse the rioting fans. The match was suspended for 40 minutes while police tried to restore order but the referee was forced to call off the second-leg, final-round qualifier. Ivory Coast had already been included in Monday’s seedings draw for the 2013 Nations Cup , which will be held in South Africa between 19 January and 10 February.